"New Hampshire Birth Records, Early to 1900," database with images, FamilySearch (https://familysearch.org/ark:/61903/1:1:FL5C-2XG : 12 December 2014), Minnie Woodbury, 24 Jun 1870; citing Dunbarton, Merrimack, New Hampshire, United States, Bureau of Vital Records and Health Statistics, Concord; FHL microfilm 1,001,055. George Plummer Hadley, History of Goffstown, New Hampshire. 1733-1920, Published by the Town, (1924) , p. 567. Your Woodbury/Ober Family Web Site, at http://www.woodburyober.com/d7.html. Unfortunately, this website no longer exists. About 1865 Moses H. Woodbury and Daniel Levi Woodbury served in the War of the Rebellion, co. B, 1st Regiment, Volunteer Heavy Artillery. "New Hampshire Births and Christenings, 1714-1904," database, FamilySearch (https://familysearch.org/ark:/61903/1:1:FDJF-ZMB : 12 December 2014), Moses H Woodbury, 25 May 1839; citing DUNBARTON TWP,MERRIMACK,NEW HAMPSHIRE; FHL microfilm 1,001,055.d8.html citing NH State Vital Records, Concord, NH. George Plummer Hadley, History of Goffstown, New Hampshire. 1733-1920, Published by the Town, (1924) , p. 568. "New Hampshire Death Records, 1654-1947," database with images, FamilySearch (https://familysearch.org/ark:/61903/1:1:FSLV-8YM : 12 December 2014), Moses H Woodbury, 22 Feb 1868; citing , Bureau Vital Records and Health Statistics, Concord; FHL microfilm 1,001,116. George Plummer Hadley, , p. 568. Caleb Stark, History of the Town of Dunbarton, Merrimack County, New-Hampshire, from the Grant by Mason's Assigns in 1751 to the Year 1860, , at https://books.google.com/books?id=Cv7hcQ8-5bIC . Concord: G. Parker Lyon, (1860) , p. 154. 1880 United States. Census Office. 10th census, 1880 federal population census, Washington, District of Columbia: National Archives and Records Service, ([19--]) , FHL Film 1254762; National Archives Film T9-0762; Page 294D. Nathan Silver Woodbury was born on July 20, 1812 in Dunbarton Center, Merrimack County, New Hampshire. living at Thornton, Grafton County, New Hampshire. "New Hampshire Marriages, 1720-1920," database, FamilySearch (https://familysearch.org/ark:/61903/1:1:FDLX-87T : 31 December 2014), Hiram Merrill and Sarah J. Woodbury, 29 Dec 1890; citing reference 2:1FH71NQ; FHL microfilm 1,001,284. 1880 United States. Census Office. 10th census, 1880 federal population census, Washington, District of Columbia: National Archives and Records Service, ([19--]) , Census Place: Thornton, Grafton, New Hampshire; Roll: 765; Family History Film: 1254765; Page: 407C; Enumeration District: 100; Image: 0535. "New Hampshire, Death Records, 1654-1947," index and images, FamilySearch (https://familysearch.org/pal:/MM9.1.1/FSLV-D4M : accessed 27 Oct 2012), Nathan S Woodbury, 17 Jun 1883. 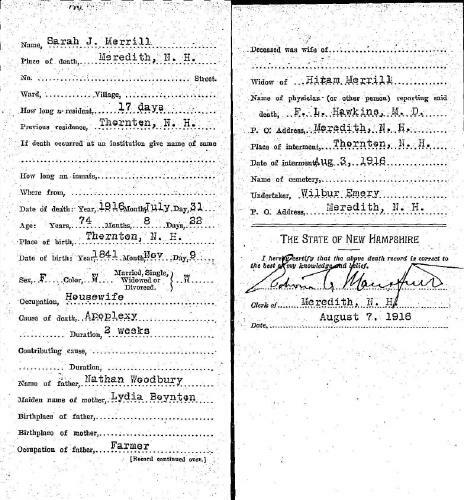 "New Hampshire Marriages, 1720-1920," database, FamilySearch (https://familysearch.org/ark:/61903/1:1:FDLX-875 : 31 December 2014), Hiram Merrill and Sarah J. Woodbury, 29 Dec 1890; citing reference 2:1FH71NQ; FHL microfilm 1,001,284. 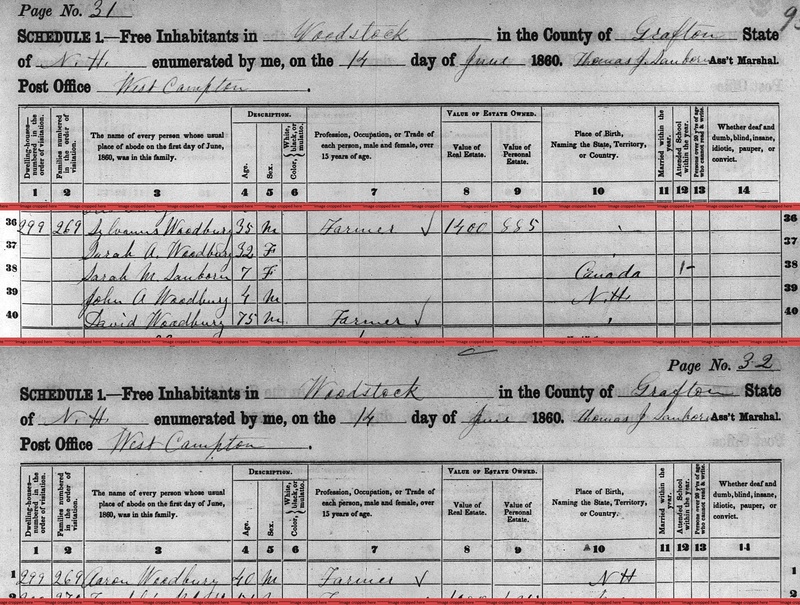 "United States Census, 1870," database with images, FamilySearch (https://familysearch.org/ark:/61903/1:1:MH5X-G4P : 17 October 2014), Albert F Woodbury in household of Nathan S Woodbury, New Hampshire, United States; citing p. 5, family 39, NARA microfilm publication M593 (Washington D.C.: National Archives and Records Administration, n.d.); FHL microfilm 552,340. "New Hampshire Marriage Records, 1637-1947," database with images, FamilySearch (https://familysearch.org/ark:/61903/1:1:FL84-GZ5 : 12 December 2014), Francis C. Woodbury and Mary R. Howland, 11 Nov 1902; citing Meredith, , New Hampshire, Bureau of Vital Records and Health Statistics, Concord; FHL microfilm 2,070,747. "New Hampshire Death Records, 1654-1947," database with images, FamilySearch (https://familysearch.org/ark:/61903/1:1:FSVP-LPN : 12 December 2014), Milton B. Woodbury, 24 Mar 1934; citing Laconia, , New Hampshire, Bureau Vital Records and Health Statistics, Concord; FHL microfilm 2,131,637. 1900 United States. Census Office. 12th census, 1900 population census schedules, Washington, District of Columbia: Bureau of the Census Micro-Film Laboratory, ([197-]) , "United States Census, 1900," database with images, FamilySearch (https://familysearch.org/ark:/61903/1:1:MMLN-N9S : 20 January 2015), Orrin Woodbury, Farmington town (west part), Franklin, Maine, United States; citing sheet 5A, family 109, NARA microfilm publication T623 (Washington, D.C.: National Archives and Records Administration, n.d.); FHL microfilm 1,240,592. "United States Census, 1900," database with images, FamilySearch (https://familysearch.org/ark:/61903/1:1:MMLN-Y5D : 20 January 2015), Polly W Gould, Farmington town (west part), Franklin, Maine, United States; citing sheet 4A, family 84, NARA microfilm publication T623 (Washington, D.C.: National Archives and Records Administration, n.d.); FHL microfilm 1,240,592. George Plummer Hadley, , p. 568, shows the birthdate as "1843." George Plummer Hadley, History of Goffstown, New Hampshire. 1733-1920, Published by the Town, (1924) , p. 566. 1880 United States. Census Office. 10th census, 1880 federal population census, Washington, District of Columbia: National Archives and Records Service, ([19--]) , FHL Film 1254479; National Archives Film T9-0479; Page 565A. "New Hampshire Death Records, 1654-1947," database with images, FamilySearch (https://familysearch.org/ark:/61903/1:1:FSJN-929 : 12 December 2014), Sarah J. Merrill, 31 Jul 1916; citing Meredith, Belknap, New Hampshire, Bureau Vital Records and Health Statistics, Concord; FHL microfilm 2,110,937. "United States Census, 1900," database with images, FamilySearch (https://familysearch.org/pal:/MM9.3.1/TH-266-12049-55869-36?cc=1325221 : 5 August 2014), New Hampshire > Grafton > ED 74 Thornton town, Waterville town, Raymond grant (part adjoining Hatch and Cleaves Grant on south > image 4 of 13; citing NARA microfilm publication T623 (Washington, D.C.: National Archives and Records Administration, n.d.). Church of Jesus Christ of Latter-day Saints. Salt Lake Temple, IGI reference to Endowments for the dead, 1893-1970; heir indexes, 1924-1956; baptisms for the dead, 1941-1970, Salt Lake City: Filmed by the Genealogical Society of Utah, (1959-1979) , Film Number: 184229, Page Number: 203, Reference Number: 4455. Church of Jesus Christ of Latter-day Saints. Salt Lake Temple, Sealings of children to parents, 1893-1942; heir indexes, 1893-1942, Salt Lake City: Filmed by the Genealogical Society of Utah, (1958) , Film Number: 1239647, Page Number: 368, Reference Number: 13005. Your Woodbury/Ober Family Web Site at http://www.woodburyober.com/, d8.html. Sawyer, Susanna C. Mrs. widow Elisha S. boards Rufus P. Dow. "New Hampshire, Death Records, 1654-1947," index and images, FamilySearch (https://familysearch.org/pal:/MM9.1.1/FSLL-VJM : accessed 05 Nov 2012), Susannah C Sawyer, 01 Jun 1897. Harrison Colby, A genealogy of the descendants of Abraham Colby and Elizabeth Blaisdell, his wife, who settled in Bow in 1768, , at https://archive.org/details/genealogyofdesce00colb . Concord, N.H.: Printed by the Republican Press Association, (1895) Microfilm #896944 of the Family History Library, Salt Lake City, Utah, p. 124. 1880 United States. Census Office. 10th census, 1880 federal population census, Washington, District of Columbia: National Archives and Records Service, ([19--]) , Census Place: Gilford, Belknap, New Hampshire; Roll: 760; Family History Film: 1254760; Page: 52B; Enumeration District: 005; Image: 0107. Find A Grave Memorial# 49708223. "New Hampshire Death Records, 1654-1947," database with images, FamilySearch (https://familysearch.org/ark:/61903/1:1:FSVH-GBW : 12 December 2014), Kendrick D. Sawyer, 08 Jun 1921; citing Laconia, Belknap, New Hampshire, Bureau Vital Records and Health Statistics, Concord; FHL microfilm 2,130,851. "New Hampshire Death Records, 1654-1947," database with images, FamilySearch (https://familysearch.org/ark:/61903/1:1:FSNP-636 : 12 December 2014), Elisha S. Sawyer in entry for Abbie O. Dow, 23 Jan 1922; citing Laconia, Belknap, New Hampshire, Bureau Vital Records and Health Statistics, Concord; FHL microfilm 2,079,311.
living at West Campton P. O., Woodstock, Grafton County, New Hampshire. "New Hampshire, Death Records, 1654-1947," index and images, FamilySearch (https://familysearch.org/pal:/MM9.1.1/FSLV-DZ2 : accessed 28 Nov 2012), Sylvanus Woodbury, 26 Nov 1894. "New Hampshire, Marriage Records, 1637-1947," index and images, FamilySearch (https://familysearch.org/pal:/MM9.1.1/FLFL-DQY : accessed 28 Nov 2012), Sylvanus Woodbury and Sarah A Sanborn and null, 1850. World War I Draft Registration Cards, 1917-1918, at http://content.ancestry.com, National Archives and Records Administration (NARA); Washington, D.C.; Consolidated Lists of Civil War Draft Registration Records (Provost Marshal General's Bureau; Consolidated Enrollment Lists, 1863-1865); Record Group: 110, Records of the Provost Marshal General's Bureau (Civil War); Collection Name: Consolidated Enrollment Lists, 1863-1865 (Civil War Union Draft Records); ARC Identifier: 4213514; Archive Volume Number: 3 of 3. 1880 United States. Census Office. 10th census, 1880 federal population census, Washington, District of Columbia: National Archives and Records Service, ([19--]) , Census Place: Woodstock, Grafton, New Hampshire; Roll: 765; Family History Film: 1254765; Page: 438D; Enumeration District: 103; Image: 0598. Find A Grave Memorial# 64162514. 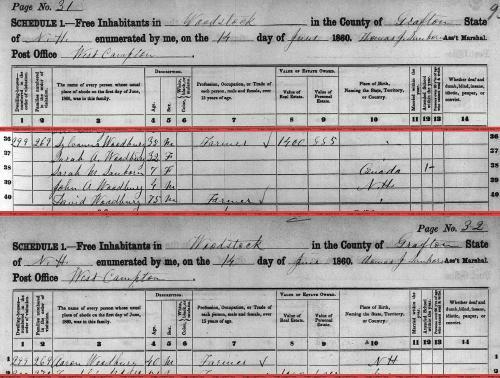 "United States Census, 1910," database with images, FamilySearch (https://familysearch.org/ark:/61903/1:1:MLZ3-4TC : 29 October 2015), Violet E Woodbury in household of Elmer E Woodbury, Woodstock, Grafton, New Hampshire, United States; citing enumeration district (ED) ED 75, sheet 4A, NARA microfilm publication T624 (Washington, D.C.: National Archives and Records Administration, n.d.); FHL microfilm 1,374,874. Your Woodbury/Ober Family Web Site, at http://www.woodburyober.com/citing NH State Vital Records, Concord, NH. Unfortunately, this website no longer exists. Your Woodbury/Ober Family Web Site at http://www.woodburyober.com/, citing NH State Vital Records, Concord, NH. This Woodbury website gives his parents as I currently list, however given the age of the mother and the 22-year gap between the birthdates of his sister Minnie and his next youngest siblling, I question this parentage. "New Hampshire Marriage Records, 1637-1947," database with images, FamilySearch (https://familysearch.org/ark:/61903/1:1:FL84-547 : 12 December 2014), Mary E. Moulton in entry for Wilbert M. Woodbury and Sarah E. Morrill, 16 Aug 1902; citing Rumney, , New Hampshire, Bureau of Vital Records and Health Statistics, Concord; FHL microfilm 2,070,747.